I got my first job in the game industry in 1999 which is right around the time Crash Team Racing originally launched. 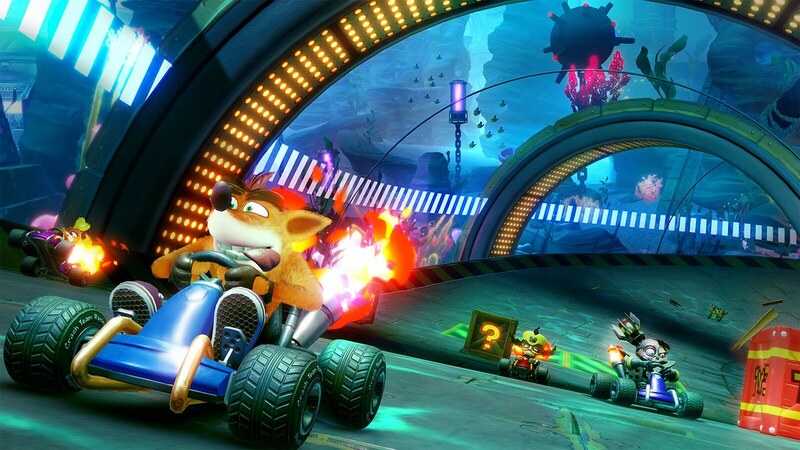 I was a huge fan of the Crash Bandicoot series at the time, so you can imagine my excitement when I heard a brand-new kart racing game starring Crash was coming out! I remember how smart I thought it was to introduce an adventure mode in a racing game. There was nothing like it at the time. The amount of time I spent playing that game! The countless hours I spent competing against my girlfriend at the time who had also started in the game industry. It was nothing short of my favorite game! Fast forward many years. Our studio gets the proposition, ‘’How would you guys feel about remastering CTR?’’. I remember pausing for a second. And then I blurted out: ‘’You’re kidding, right?’’ I felt a sudden rush of adrenaline. That tingling feeling of joy and excitement spreading through your whole body. Throughout the discussions, I remember telling myself: ‘’Please, please, oh please, let this project become real.’’ And here we are! The game we were so eager to reveal to the world has been announced. No turning back now! We’re going full throttle towards June 21st and we’re so excited to show you what we have in store! Like myself, we have huge fans of the franchise on the development team. 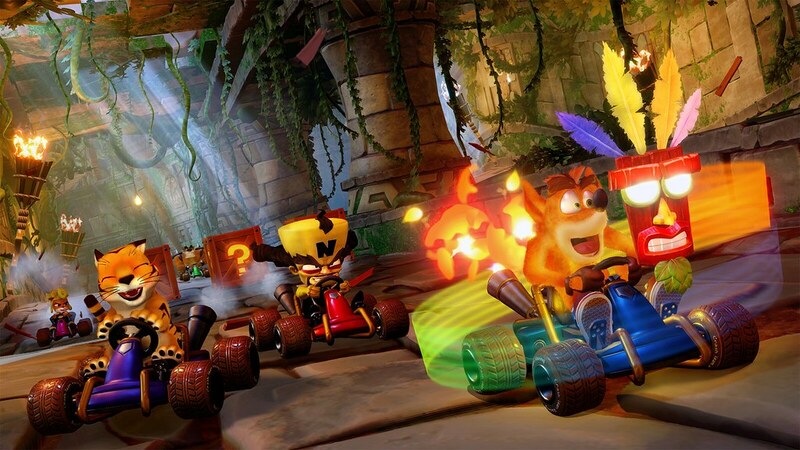 We know how dear the original Crash Team Racing is to so many people, so we’re spending a tremendous amount of time making sure it’s the same great racing experience that fans remember with a level of polish that could only be achieved by today’s standards. Our first design pillar in approaching this game was strikingly obvious: Authenticity. Whatever improvements or bells and whistles we were going to add, we needed to be authentic to the inspiration of the original experience. The technology leap of the past 19 years allows us to push the graphical fidelity to a whole new level. As much as CTR is about racing, it is first and foremost about character. We established very early on that we wanted CTR Nitro-Fueled to be brimming with personality both from an environmental and character stand point. Fans will see this attention to detail shine through in every part of the game from the camera work, to the characters’ quirky animations, to the lush environments you’re racing in. The game is called ‘Nitro-Fueled’ for a reason. As die-hard fans of the game, we felt compelled to modernize the experience and infuse it with features that are expected of any great kart racing game. Playing split screen is a lot of fun, but racing online is awesome! 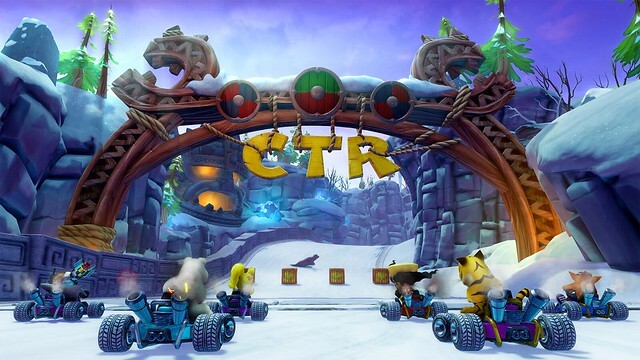 In Crash Team Racing Nitro-Fueled, you will have the opportunity to show your skills to anyone around the world and that’s a first for CTR. Plus, there’s even more that we’re adding to the experience that hasn’t been shown yet, but we can’t wait to reveal soon! By the time Crash Team Racing Nitro-Fueled ships, I will have been in the industry for 20 years. I can’t help but smile at the idea that CTR will be celebrating its 20th anniversary at the same time as I am. I guess I’ve come full circle! Thank you so much for bringing this back. It’s my favorite kart racer of all time so getting to play it with modern graphics is amazing. Day 1 purchase. It would be great if Crash Bash comes to PS4 as well together with CTR! I miss those party games! This is one of the few PS 1 games I wanted desperately to be remade, since it would be amazing online, thank you for (re) making it! FINALLY! Thank you, can’t wait for this. Now let’s get Crash Bash remade and the whole collection of PS1 Crash games will be complete. OMFG!! YESSSS FINALLYY!!! and now its going to be online, cant ask for more! Omg i loved CTR back in the day can’t wait to play it again. Will it be released in Japan? I am one of the fun who loves CTR in Japan. This is my most-anticipated game of 2019. The original is one of my favorite games of all time, and I can’t wait to see how awesome this is on PS4! I just heard this today and I’m going to be preordering it today. This is probably going to be the only game I am going to play online for all my friends are beginners at this game and now I will finally be able to receive a fair challenge in the game thanks to it being online. Cant wait for the release and hope to see everyone on the starting line. Who knows I might actually learn something new that I didn’t know before about this game. Adult dream comes true. Lol. Cant wait for this release! Im happy that at least one of the crash racing games are being put on ps4. What about tag team racing tho? I already know I’mma remember this summer by this game. Gonna play till my thumbs fall off. Also, if they put it on vr, I think me and many others would without thought go out and buy vr!! Please i would love splitscreen and online at the same time if possible… it is a big opportunity for me and my friends to feel that innet kid together no matter the place! this game have online battle mood ?or just race online mood ? Crash is my favorite video game series of all time. CTR is not only favorite cart game, but it’s singlehandedly the one game I put the most time into when I was a kid. I have been waiting on this announcement for years! When I found out, I preordered it immediately both on m console and at GameStop. I have never been so pumped for a game before! There is nothing else that could have brought more happiness to my life than reading this. This is amazing, thank you so much for doing this. Couldn’t believe when ma brother told me but I’m not 100% surprised considering the success of the Trilogy and the amount of requests for CTR.Now I have a lot of memories with CTR…had an insane amount of fun with it and I’m definitely getting it of course can’t wait to see it on ma screen but…I’m not pre-ordering not after what happened to the Trilogy.Not supporting this just to see it going multiplatform which is a huge disrespect to PS gamers…seeing the Trilogy on ninten** and specially on xb** simply broke ma heart.So yeah F activision.Thanks for doing this but I’ll wait for a price drop. Also couldn’t care less about being able to play online.Just like every racing game online it’ll be filled with cheaters in no time. 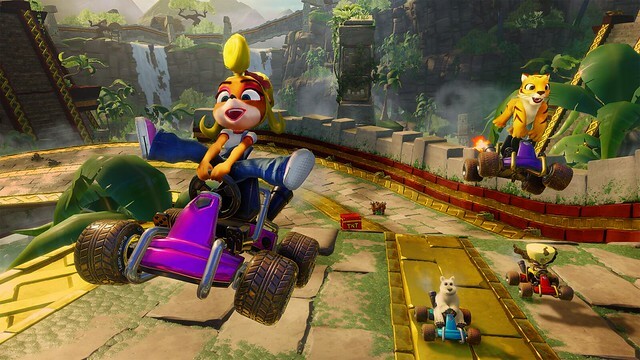 Anyway this is some really great news…PS4 needed a good kart game. Hell Yeah, I can’t wait! YO!!! At least tell ACTIVISION to add 32 Crash Bandicoot series characters alongside with 32 Race Tracks and don’t forget the 16 Battle Arenas! Local 4 player split-screen style. Championship mode, Time Trial mode, Single Race mode, Free for All mode, Tag Race mode, Team Race mode, 16 Cup Tournaments, Tag Battle mode, Team Battle mode, Elimination mode, Survival mode, and LAST BUT DEFINITELY NOT LEAST, Instant Replay after EACH and EVERY, LAST, SINGLE recent race! Post on YouTube PlayStation Live, Xbox Live, Facebook, Twitter, Instagram and brag to ALL your friends! I betcha Crash Team Racing Remastered should have a Better suited title for it to stand out more and make it WOW the crowd more. For instance, the best name the title to ever touch mankind, a title like……. Crash Grand Prix! CGP aka CRASH GRAND PRIX! GOT AN AWESOME RING TO IT!!!!! I’m simply just saying, with these many male and female characters to have just a good enough chance to race as everyone else will give players a massive variety of some of their favorites. 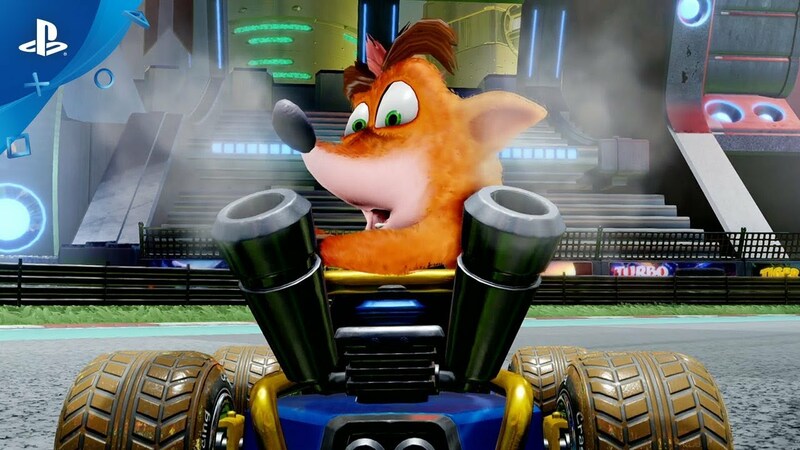 I chose these ideas on having lots of Characters, Racetrack modes, Battle modes, including Co-op Tag Team modes, Survival modes, Elimination modes, and extra content to keep ALL players busy for a while in order to have Crash Bandicoot to come out STRONGLY!!! Please, at least try to understand that Mario Kart has hogging ALL the driving and racing for FAR TOO LONG!!! It just seems a bit unfair, man. SO LET’S STAND UP FOR BOTH CRASH BANDICOOT FANS AND SPYRO FANS!!! We can’t allow Nintendo to get away with this. It’s time for for our people in both Crash Bandicoot community and Spyro The Dragon Community to FIGHT BACK!!! THIS RACE WILL NOW BE WAR!!! AGAINST THAT INFANT’S GAME MARIO KART FOR BABIES, THAT IS!!! OMG OMG OMG!!!!!!!!!!!! I FEEL LIKE MY PRAYER HAS BEEN ANSWER I HAVE BEEN I OB SINCE 2015 FOR THIS GAME TO COME ON PS4.THE LAST TIME I PLAY THE GAME WAS IN NIGERIA ON PS2. AND WHEN I BROUGHT MY PS4 I HAVE BEEN PRAYING FOR THIS DAY SO THANK YOU THANK YOU THANK YOU!!!!!!!!!!!!!!!! Just wanted to really say “Thank you” for remastering this classic cart game. It was one of my all time favorites. There also aren’t too many games that I feel that I must pre-order, but this one will. In today’s day in age, I hope that there will be at least one track that will have VR support and it would also be pretty cool to have a battle mode. But even if it doesn’t, I’m thinking that this game will become another instant classic for the PS4 generation. Thanks to all involved in this project! One of the best or maybe the biggest and brightest new I have heard on this year!!! I remember the original and it was so fun!!! Can’t wait to have this one!!! are y’all gonna do a crash bash remastered?